We would like to invite all families to attend our celebration of Peace Day 2017 with a performance in the Assembly Hall at 9am on Thursday 21st September. Classes have been preparing songs and poems and are looking forward to performing for you on Thursday. See you there! Our student council Movie Night in term 2 takes place on Thursday, November 22nd, 2018. 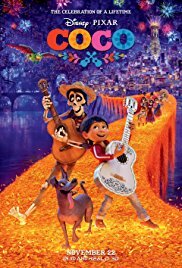 The Student Council voted for the movieCoco . The screening will take place in the school hall on the big projector just like at the cinema! Children are welcome to bring snacks and there will be a tuck shop selling treats on the night too. Children are welcome to bring along siblings, friends other family members. Tickets €5 (single) €10 (family) will be on sale outside the school every morning and afternoon. Tickets will also go on sale online.